Join Buzz, Woody and all of your Toy Story friends on an adventure! Play your way through the games, story and creative activities by tilting the pad or using the touch screen. Teaches reading comprehension, spelling, letter identification, vocabulary, pattern recognition, science and creativity. Software exclusive to InnoTab…. This toy costs approximately £14.99 (for the latest and best prices make sure you check our retailer list for the Toy Story Innotab above). 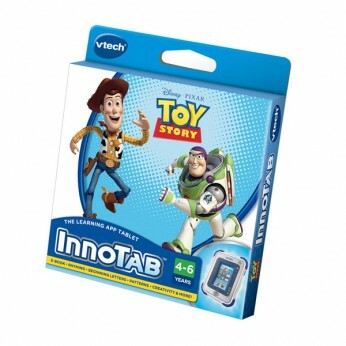 In our review of Toy Story Innotab we classed it as being suitable for ages 3 years, 4 years, 5 years but recommend you check the manufacturer specific advice before purchasing.